it is NOT a bug. You just need to convert your version 1.9 animation to version 2.x format. Please see the section on Backward Compatibility for details. The main features of Keyframe Animation are conveniently located on the toolbar to facilitate your workflow. Play Button Toggles the Object Animation on and off. Time Settings Button Toggles the display of the Scene Time Settings window. 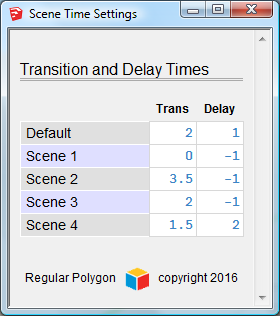 The Scene Time Settings window lets you set the transition time and delay time for each scene. Make Tweens Generates tweens -- in between scenes with the object animation "baked in". The tweens are useful for rendering, or exporting your animation to a movie directly from SketchUp. New The tweens are faster, use less resources, and now play nice with all Scene Properties. Help Button Opens up the User Guide -- the page you are viewing now -- in your browser. The menu is at Plugins/Extensions > Keyframe Animation. All the toolbar features are also accesible from the menu. Show Toolbar Toggles the toolbar visibility. Animate Objects Same as clicking the Play Button on the toolbar. Record Objects Same as clicking the Record Button on the toolbar. Scene Time Settings... Same as clicking the Time Settings Button on the toolbar. Make Tweens New Same as clicking the Make Tweens Button on the toolbar. Convert v1 to v2 New Runs a utility that will convert your 1.9 animation to version 2.x format. See the section on Backward Compatibility for details. License Info... Opens a window to display your license status or free trial status. Allows you to register a license or remove a license from this computer. User Guide 2.1 Same as clicking the Help Button on the toolbar. Contact Us Opens the Regular Polygon Contact Us page in your browser. Get Recent Updates Opens the Keyframe Animation Download page in your browser. Get a License Opens the Keyframe Animation Purchase page in your browser. There are seven easy steps to set up an animation and get your objects moving. Convert any geometry that you want to animate into groups or components. Loose geometry can not be animated. It doesn't make any difference, for animation purposes, whether something is a group or a component. So, we will refer to them generically as objects. Add some scenes. You can use the Scenes Manager for this (menu item Window > Scenes). Each scene is essentially a keyframe. You can add more scenes later, delete scenes, or change their order. To run an animation in reverse, just reverse the order of the scenes. SketchUp will animate the properties saved with a scene. Keyframe Animation will animate the objects that are recorded on a scene. You can combine SketchUp's built-in animation of any scene property, with Keyframe's object animation, and export it all to a video. New Support for all camera features. In version 2.1, the Tweens now support all the camera features, so any type of camera animation can be exported to a video, together with Keyframe's object animation. This includes the Orthographic (Parallel Projection) camera. And changes to the Perspective camera Field Of View. 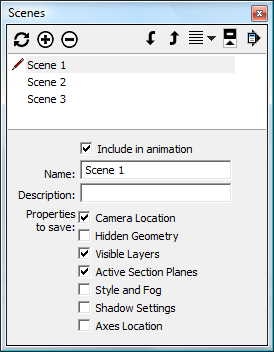 If you are creating an animation where the camera does not move, leave the Camera Location box on each scene unchecked. This way, if you want to change the perspective you view the animation from, you can change it on-the-fly, for all the scenes at once, without having to update the Camera Location property on each scene. Select the first scene by clicking on the scene tab. The tab becomes highlighted. The scene with a highlighted tab is referred to as the current scene. You can change which scene is the current one by clicking on different tabs, or by double-clicking on the scene name in the Scenes Manager. Now use the Move Tool , the Rotation Tool , or the Scale Tool , to position and/or resize the objects on the current scene. Click the Record Button on the toolbar to save the position data of objects on the current scene. It doesn't make any difference whether the Play button is toggled on or off. A bell will ring, and the objects that were recorded will remain selected afterward, so you can see which ones they are. A plop sound indicates that no objects were recorded. New The record feature works slightly different in version 2.x. We think this logic is more intuitive and functional. If any objects are selected when you click the Record button, then only those objects will be recorded. This approach gives you the most control. If nothing is selected when you click Record, then all moving objects (i.e. objects that have position data saved for any scene) will be recorded. This approach saves time. Re-recording an object updates its position data. To revise an animation, simply move the objects to new positions and re-record. New in version 2.x: The Select Button. There is a new Select Button on the toolbar. It selects all objects that have position data saved on the current scene. Then, with the objects selected, you can record them all in one click. It is also a quick way to check if an object has position data saved on the current scene or not. Tip: Objects must be groups or components. Loose geometry can not be recorded or animated. Use the Entity Info window to check the type (context menu right-click > Entity Info). The Erase Button is kind of the opposite of Record. It deletes the position data of all selected objects on every scene. It is useful if you want to take a moving object out of the animation and make it stationary. If you copy an object (e.g. Move + Ctrl), that will copy the object's position data too. So, you will probably want to click the Erase Button to delete it. Otherwise, the copied object will move to the same location as the original object during the animation. The position data is tied to the scene names. So, if you change a scene's name, then the object's position data associated with it is lost. You will need to re-record the objects on that scene. That is the basic workflow. Just repeat steps 3, 4, and 5 for each scene. The Play Button on the toolbar toggles Object Animation on or off. When toggled on, objects will automatically move to their recorded positions during each scene transition. When the Play button is toggled off, the objects won't move. Object animation is turned off by default when SketchUp first opens. You can test out the animation by selecting the scenes, one at a time, to initiate each scene transition. Or run a slideshow of the entire animation (View > Animation > Play). Tip: What to do if objects don't move. If your objects are not moving, here are some steps to diagnose the cause. Check if the Play Button is toggled off. It is turned off by default when SketchUp opens. An object will not move if there is no position data saved on the scene for it. Click the Select Button to see if the object has positon data saved on the current scene. If the object still doesn't move, maybe the position saved is the same as where it's at already. Try moving it somewhere else, and then select the scene tab. It should move back. If an object is open for editing, the Object Animation will still proceed, but it is restricted to the moving objects that are contained in the active context. There are three types of interpolation depending on whether you Move , Rotate , or Scale the objects. Things can get more complicated if you combine the operations. If you Move the object between scenes, then it is interpolated as a translation. If you Rotate the object between scenes, then the plugin figures out the correct point of rotation and axis of rotation for the interpolation. Note that rotations are always interpolated through the smallest angle between the two orientations. So, the angle will always be less than or equal to 180 degrees. If the angle is exactly 180 degrees, the direction is ambiguous, so the object could rotate either way. If you scale the object between scenes, then the object's size is interpolated. The scale factor can be positive or negative for each component axis (red, green, or blue). A negative scale factor amounts to a reflection along that axis. New in version 2.x: Fixed the negative scale factor bug. In version 1.9, there was a bug that occurred if an object was scaled past zero, which resulted in a negative scale factor. Now a negative scale factor is interpolated as a reflection. A rotation and a translation can not be combined, in general. However, if the translation is parallel to the axis of rotation, then Keyframe Animation will interpolate it correctly. For the other situations, it is possible to combine a translation with a rotation by animating nested objects. You can translate and scale an object at the same time. Keyframe Animation will always interpolate this correctly. A scale and a rotation can usually be combined. If the point scaled about lies on the axis of rotation, then Keyframe Animation will interpolate it correctly. If they are different, the interpolation will use a fixed point in between to both rotate and scale about. If you want to scale about one point, while rotating about a different point, you can do that by animating nested objects. New in version 2.x: Reflections. If you flip an object along its red, green, or blue axis (e.g. context menu right-click > Flip Along), that reflects it. Keyframe Animation 2 interpolates a Reflection by moving every point along a line that passes through a "mirror plane" in the middle to a point an equal distance on the other side -- reflecting the object in the process. New in version 2.x: Inversions. If you flip an object along all three axes, that inverts it. It amounts to a reflection through the center point. Keyframe Animation 2 interpolates an Inversion by moving every point along a line that passes through the center to a point an equal distance on the other side -- inverting the object in the process. If you flip an object along two axes, that is actually the same operation as rotating it 180 degrees, so it is interpolated as an ordinary rotation. Keyframe Animation allows you to animate subgroups (or subcomponents) to any depth. Subgroups (subcomponents) move relative to their parent. They inherit their parent's motion, and then apply their own movement relative to it. This allows you to compose translations, rotations, and scaling operations, in order to create more complex types of motion. To record a subgroup (subcomponent), select it first, then click the Record button. Usually, the easiest way to select a nested object is with Outliner. The other way is to open the objects that contain it by successively double-clicking on them, until you can select the nested object. Click the Time Settings Button on the toolbar to display the Scene Time Settings window. This interface allows you to set the transition time and delay time for each scene. The time is rounded to half-second intervals. The transition time is the number of seconds it takes for the animated objects to move to their recorded positions. It is also the time it takes for scene properties -- like camera location, or shadow settings -- to transition to the value saved with the scene. A negative value will use the default transition time. The delay time is the number of seconds the animation will wait before beginning the transition to the next scene. A negative value will use the default delay time. All settings are saved as soon as the text box loses focus. A bell will ring to indicate the value has changed. Once your animation is set up, you may want to export it to a movie, or to a sequence of images. SketchUp has a built-in utility to export animations, but it only exports the SketchUp scene property animation, and ignores the Keyframe object animation. However, Keyframe Animation has a workaround that solves this. It creates many scenes in between the keyframes, with copies of the moving objects interpolated between their keyframe positions. The in between scenes are called tweens for short. They can be generated for any frame rate up to 60 frames per second. These tweens have the object animation "baked in", so it can be exported directly from SketchUp, along with the scene property animation. The algorithm that creates the tweens in version 2.1 is faster, more efficient, and uses less memory. The tweens are not so resource intensive now. You will see the improvement over version 1.9. New Tweens Support All Scene Properties. In version 2.1, the tweens play nice with ALL the SketchUp scene properties. Now you can combine Keyframe's object animation with ANY of the animated scene properties, and export it all to a movie. To generate the tweens, click the Make Tweens button on the toolbar. Tip: Close all window managers first. Before you generate the tweens, close all dialogs like Outliner, Model Info, the Scenes Manager, the Layers Manager, etc. If they are open, it can greatly slowdown SketchUp, since then it tries to update the dialogs while it creates the tweens. You will be asked to set a frame rate. The frame rate specifies how many tweens will be created for each second of transition time. The frame rate can be from 1 to 60 frames per second. It is best to use the same frame rate as the video that will be exported. A higher frame rate makes the interpolation smoother, but more tweens will be created. Tip: Export the Animation in Parts. Before the tweens are generated, a message pop-up will display the number of tweens that will be created. If the number is greater than 1500 tweens, you may want to cancel the operation. The greater the number, the more it will slowdown SketchUp, and possibly crash it if you run out of memory. Larger animations should be broken up and exported in parts. The tweens will be created in a new model. The original Keyframe model is NOT modified. A Save As dialog will prompt you for a name and location to save the Tweens model. The default name is the Keyframe model name with ".tweens" appended to it. Since there are usually hundreds of tween scenes, it might take a minute or two generate all of them. In the tween tab, the first number indicates which keyframe the tween is associated with. The second number shows the percent of transition to that keyframe. Click the Undo Tweens button on the toolbar to return to the original Keyframe model and make some adjustments. It doesn't really undo the tweens; they are in a separate model, which you can save before you leave. This just restores the original Keyframe model, so you can resume working where you left off. Note that all the toolbar buttons are disabled in the Tweens model except the Undo Tweens button , and the Help button . Now run the SketchUp export utility to turn your tweens into movie (or an image sequence). Each tween will become one frame in the movie. The menu item is, File > Export > Animation > Video.... This brings up the Export Animation dialog box. The options available depend on your version of SketchUp and whether it is Make or Pro. This SketchUp Help article has more information about exporting video animations. If you see a grayed out toolbar, it is not a bug! What is going on under the hood in version 2.x is so different that your version 1.x animation will not run. Basically, if you open a model with version 1.x position data, all of the commands on the toolbar and menu will be disabled. However, there is a quick and easy solution. Version 2.1 has a utility that will convert Keyframe Animations from version 1.9 format to version 2.x format. Access is from the menu item, Keyframe Animation > Convert v1 to v2. The Keyframe 2.x compatible animation is created in a new model. You can save it with any name you want. The original model is NOT modified. Once the new model is open, your old animation will work in Keyframe Animation 2.x, and all the toolbar buttons and menu items will be enabled normally. 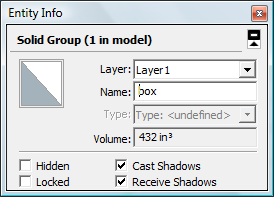 This feature does require SketchUp 2014 or newer.